While applesauce is easy on the stovetop, it’s a total SNAP in an Instant Pot. This applesauce (pear applesauce… pearplesauce?) is delicious on its own, but it’s even better added to a bowl of oatmeal or spooned over waffles for breakfast. 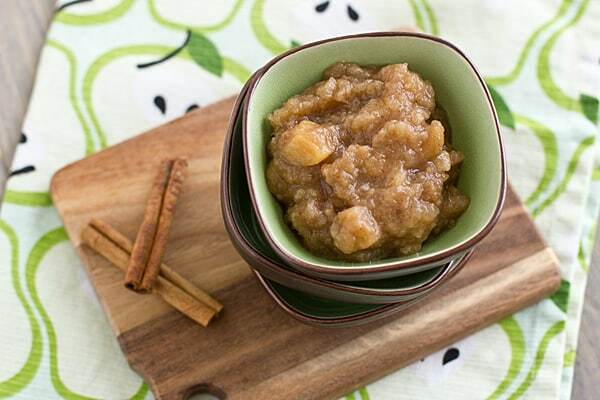 Pear Applesauce flavored with chai spices and slow-cooked in a crockpot. Adapted from Skinnytaste’s Crock Pot Applesauce. Combine all ingredients in an Instant Pot. Secure the lid and cook on high pressure for 8 minutes. For a chunkier sauce, use a slotted spoon to remove half of the apple and pear chunks. Use an immersion blender to puree the remaining fruit and then stir in reserved fruit chunks (alternately, you can cool the mixture and puree in a blender or food processor). For a thinner sauce, do not remove any fruit before pureeing. Yummy! This looks delicious! I’ve never had “real” apple(pear)sauce. We had home ec in middle school and got to learn how to sow, cook, and iron (seriously when did I grow up the 1940s!). Anyways, it was my favorite class too. I just loved learning how to cook different things. I wish I learned how to iron in school. Seriously, I could use that. Oh my goodness, that looks just divine! I love making homemade applesauce, but I’ll try your version next! Thank you! Let me know what you think if you make it–this was my first try in a slow cooker & I think I’m going to do it this way from now on. Oh yum! We make homemade applesauce all the time during the year and this looks awesome! I’m drooling over here! I love making fruit butters and the like in my slow-cooker; the smell is amazing. I want to try making chai-spiced apple butter next! I’ve never attempted fruit butters before, but my mom got me a new slow cooker for Christmas, so now I’m on a slow cooking kick. You what I love with Applesauce?… Popcorn. I pop it from the kernels, not from the bag. So there’s no flavor (salt, butter).And then I dip it (while warm) in apple cinnamon sauce. So, thank you ma’am for another recipe I NEED to make. <3! You *know what I love… oops! Popcorn dipped in applesauce? Okay, that’s a little bit weird. 😉 But applesauce is definitely better than butter & yellow food coloring! You had cooking as a credit? Jealous!! I didn’t discover my love of cooking until probably age 29, when I became a parent. Suddenly feeding my family well became important. Yum – this is applesauce for grownups! And I love applesauce in my oatmeal it makes it so much more filling and hearty! Me too! I used to always use the little oatmeal packets, but since they’re so full of sugar, I’m trying to eat the old-fashioned or steel cut oats instead. But they need a little something to spice them up, and applesauce is a good addition. Oh my yum! I’ve bookmarked, pinned, stumbled, tweeted, and shared on FB. I can’t wait to try it! Thank you for sharing this! It is really good and I think next time, I’m going to double the recipe and freeze some (because I’m terrified of canning–I just know I will end up giving people botulism!). I feel the same way about canning! Oh this looks really delicious. I really like applesauce and love to spice it up! Thank you! I love applesauce too–it makes a nice guilt-free dessert. “I never have to be afraid of these people again. Because I have just witnessed them making applesauce.” hahah! i love, love, love your blog and this recipe! -gasp- I’ve been looking for something like this ever since my local Trader Joe’s stopped carrying their pear sauce. It was my favorite! Can’t wait to try! What pears do you recommend? How did I miss that Trader Joe’s had pear sauce?! Too bad they stopped carrying it before I got to try it! Any kind of pear will work in this; I like to use 2 firmer ones for chunkiness and 2 softer ones for sauciness. This looks great! Quick question – is it fresh ginger that you use or ground ginger? Oops, I don’t know why I didn’t have that in there. It’s ground–I just changed the recipe. Thanks for pointing that out! Perfect! I received just the right amount of apples and pears in my CSA box and made this right away. It is a new favorite with my husband and son. Made this in the crockpot yesterday was to die for! Did not have cardamom thanks to a google search substituted equal parts cinnamon and nutmeg. Will definitely make again!